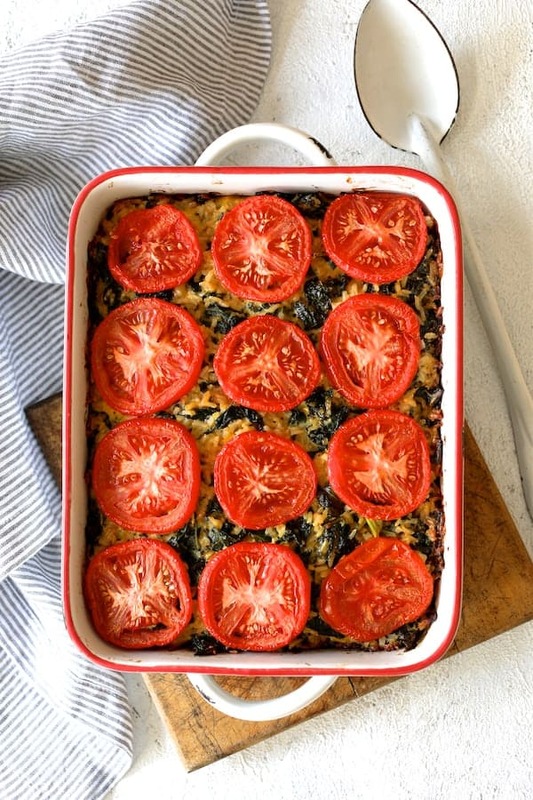 Brown Rice Cheddar Kale Casserole is perfect meatless comfort food that’s also super versatile! Vary the grains and vary the greens! Getting back in the swing of things after the holiday season? My goal this week was to get all of my Christmas decorations down and put away. Because it’s always difficult for me to get into the Christmas spirit, I’m not sure which feels better: Getting all of them up so I can admire them or getting them all down and put away. Having Christmas over with feels pretty darn good even though my time with family was wonderful! I treasured every moment! 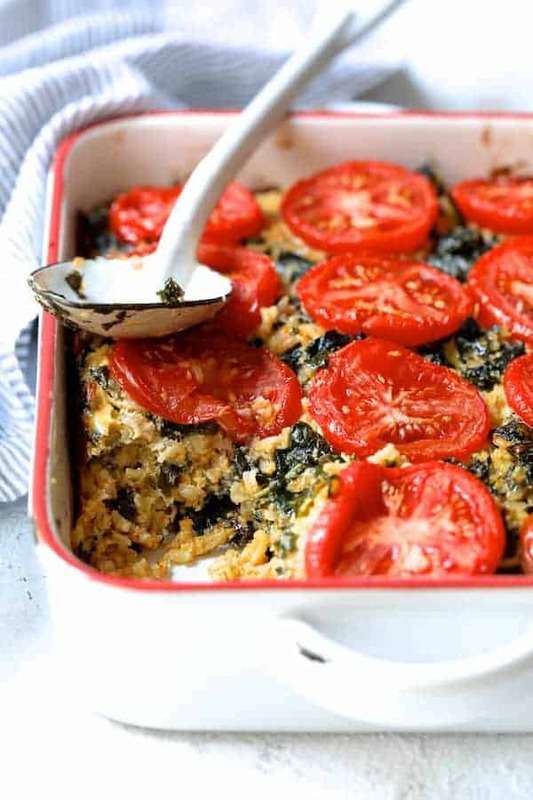 Here’s something that feels good anytime: Brown Rice Cheddar Kale Casserole. Or, perhaps I should call this one: Heading-Out-of-Town Casserole. With everything there is to do before leaving for any length of time, using up what’s on hand forces my creativity and I find it a lot of fun. I had brown rice left over from my Spicy Asian Pork Cabbage Rolls and kale that was crying out to get used. Because we’re both cheeseheads from Wisconsin, we ALWAYS have a wide variety of cheese in our house. You’re probably wondering about the tomatoes–especially this time of year. My mother-in-law recently visited and whenever she visits, bacon, lettuce and tomato sandwiches are a must-make. She L-O-V-E-S BLTs and so does my husband so we always have to do at least one round of BLTs. 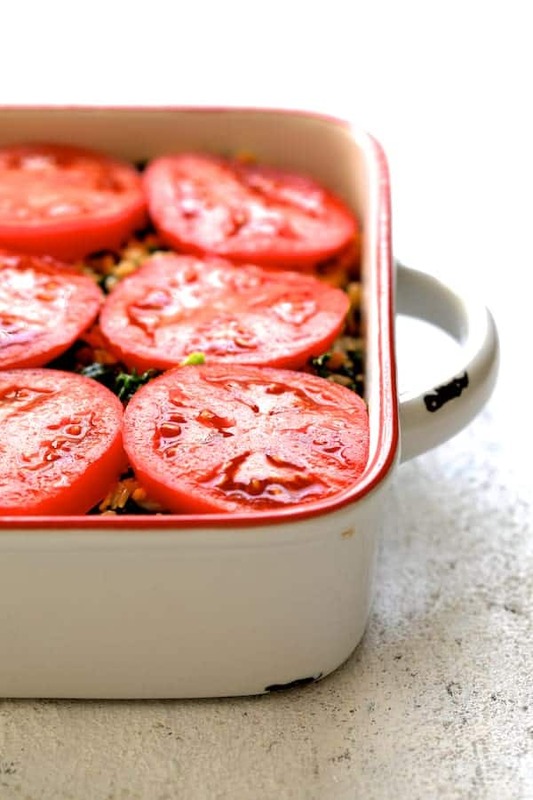 We generally only buy grape or cherry tomatoes this time of year, however these weren’t bad and they made a great topping for this casserole. Other tomatoes that are okay in the off-season are Campari or Roma (plum) tomatoes. Similar to my Grains and Greens Casserole, you can vary the grains and vary the greens. Quinoa or lentils will also work and spinach, Swiss chard or broccoli raab work well instead of kale. That’s it! Easy, cheesy, pleasey hearty vegetarian comfort food that you can also make ahead of time and bake at a later time. Brown Rice Cheddar Kale Casserole is perfect meatless comfort food that's also super versatile! Vary the grains and vary the greens! Preheat oven to 375 degrees. Lightly oil a large baking dish such as a 13 x 9-inch pan. Heat oil in a large skillet or saute pan over medium-high heat. Add the onion, reduce heat to medium and cook 7 to 8 minutes or until softened. Add the garlic and kale. Continue cooking, stirring often until the kale is wilted. Transfer to a large bowl and let cool. Add the brown rice and Cheddar cheese. Add salt and black pepper to taste. Stir in eggs and milk. Transfer mixture to the prepared baking dish and smooth the top. Top with sliced tomatoes. Bake for 45 minutes to 1 hour or until set. Prep time does not include cooking the brown rice. To make 3 cups cooked brown rice, use the instructions for 4 servings on the package of uncooked brown rice. I made this and it was awesome! It’s a makes great vegetarian dinner. The only thing I did different was to add a can of kidney beans. It gave it nice color and boosted the protein. Thanks for a great recipe! Love it! Thanks, Mark and so glad you enjoyed! 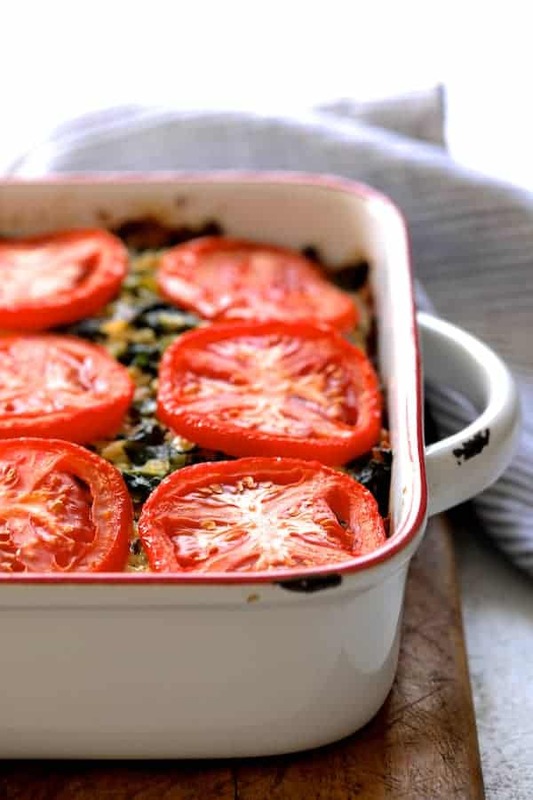 It really is a great vegetarian casserole. I froze part of it and it worked out great. I got so inspired by the dish that I made one right away.. albeit different. I had some leftover spinach and corn dish and I made a rice casserole with that! I skipped the eggs though as I wanted to keep it vegetarian. Hi, Ashima, That sounds like a great spin on this dish. I love being able to use things up any possible way. Glad you enjoyed!